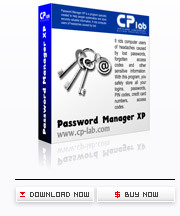 CP-Lab.com proudly presents Password Manager eXtra Protection - a program designed for working with passwords and other confidential information (Windows 10 compatible). Password Manager eXtra Protection (XP) allows you to create several databases for storing desired information. Each database has its own access password and is encrypted with the algorithms of your choice. This means capability to apply several different encryption algorithms at a time, which significantly increases protection against unauthorized access of your data. Besides, the program comes with an option to automatically exit databases when idle for a set period of time, which decreases the likelihood of stealing your data when leave your computer with application running (for example, you have been distracted by other things or simply forgot to quit the program). Quite frankly, Password Manager XP can considerably simplify your work with the Internet and usual Windows applications. It can autofill web pages, registration forms, logon windows, etc. This feature is compatible with Microsoft Internet Explorer, Firefox, Google Chrome, Opera and majority of usual Windows applications. You can install Password Manager XP Mobile to your Windows Mobile-based device and access your data easily when your laptop or desktop PC is not available. 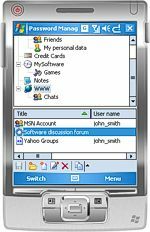 Password Manager XP installed on your Pocket PC allows you to keep your data secure and right in your pocket. Password Manager XP comes with a user-friendly interface that is easy to navigate and adjust. Password Manager XP is your personal Password Keeper! Attention! Make sure you store the password to your databases in a safe place. Do not lose it! Our software has no backdoors or masterkeys. Should you lose or forget your password, there is nothing we can do to help you gain access to your data, since the program employs strong encryption algorithms that make hacking or password picking impossible. Our application is spyware and adware free, and contains no trojans or viruses. You can hire independent experts to analyze our software to confirm this fact and to get an unbiased conclusion about software's encryption level. Our reputation is based on the products we release. That's why we put extra efforts in making our software very dependable and user-friendly, features that our customers praise our products for most often. Our software solutions are used by hundreds of companies all over the world.